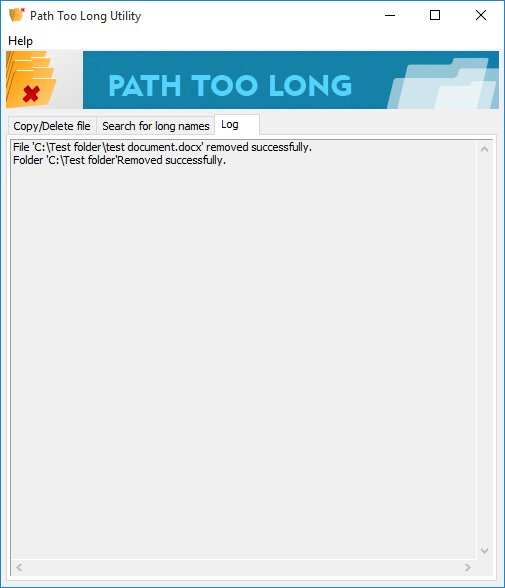 Destination Path too long ™ Windows utility - delete long name files! Deep application refactoring. Fast performance, no bugs. 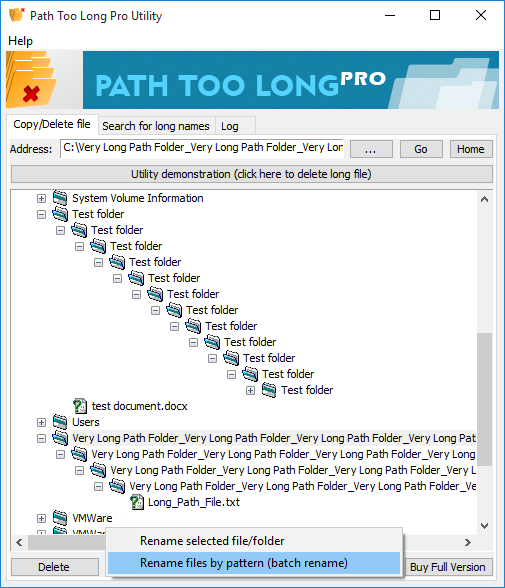 Path Too Long and PTL PRO software better works with network folders now. 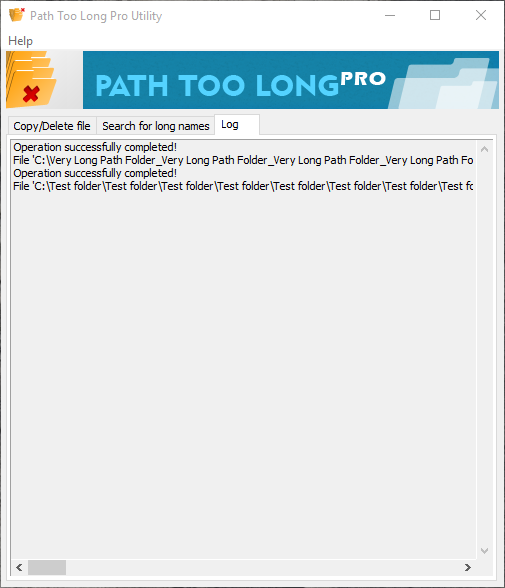 Path Too Long and Path Too Long PRO are Windows tools to copy and delete files and folders with long paths. Just browse to the file and press a button to delete it, that’s it! 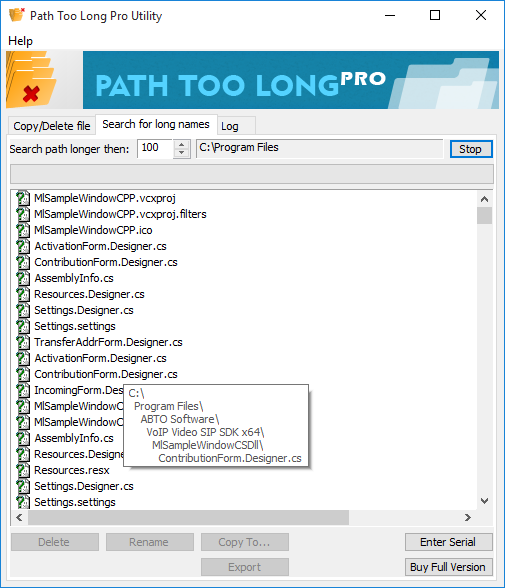 Now you are able to rename long file names with new feature of Path Too Long PRO! This software solves the problem with inability to copy, rename and delete files and folders with long paths or locked by some application. They could be created by virus / adware / different OS / other software. Normally one can’t access such files under Windows and therefore can’t delete them either. Delete Long File Names Effortlessly! 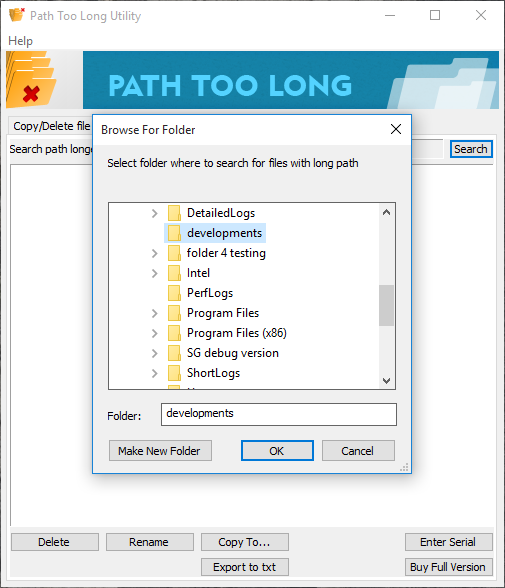 Path Too Long Utility uses a set of different methods to delete persistent or locked files, like: attempting to close the handle, killing the process holding the file open, unloading the DLL that may have open the file handle, scheduling the file to be deleted on the next reboot, etc. Such error 1320 powerful removing tool as Path Too Long / Path Too Long PRO is compatible to Windows 2000/2003/XP, Windows Vista and Windows 7. 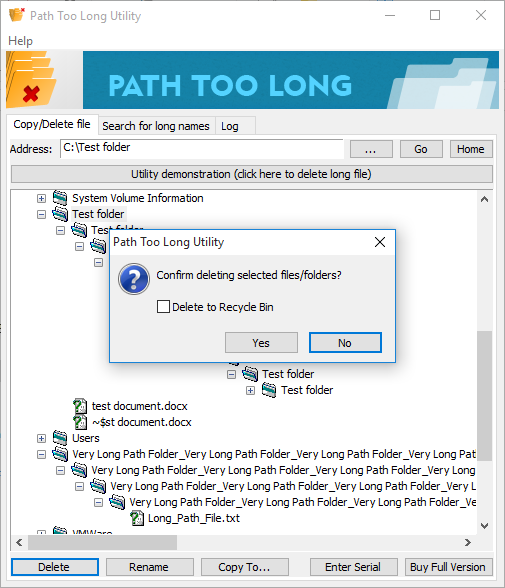 Path Too Long Utility™ uses a variety of methods to delete the persistent or locked files, including attempting to close the handle, killing the process holding the file open, unloading the DLL that may have open the file handle, scheduling the file to be deleted on the next reboot, etc. 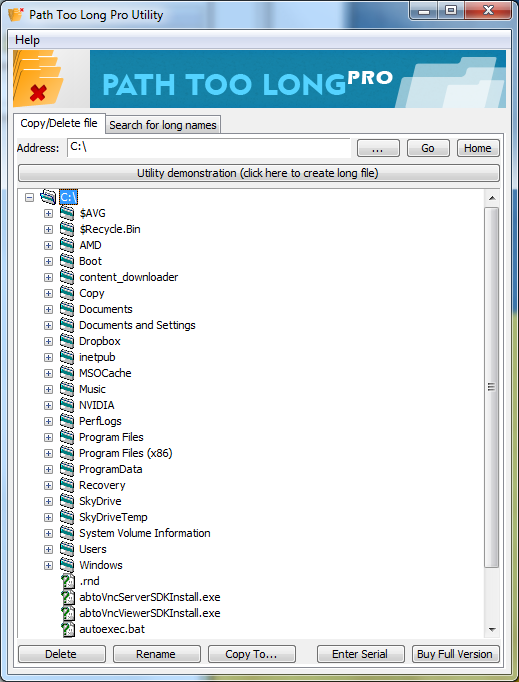 Path Too Long and Path Too Long PRO is able to work and delete files / folders under Windows 2000, XP, 2003, Vista and Windows 7. Destination path too long error 1320 or “filenames too long” issue will not be a problem for you anymore with our long path error fixer software. when you tried to delete, move or rename a file? Then this program will be helpful. 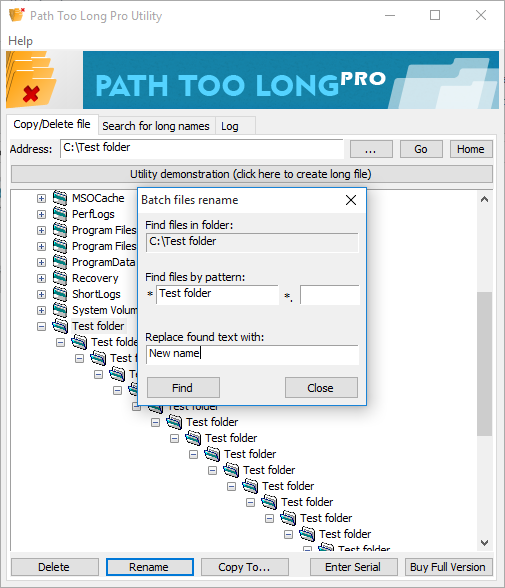 Path Too Long Utility™ identifies the processes (running programs) that have locked that file, preventing it from being deleted, moved or renamed. Have destination path too long / filename is too long troubles? Multiple users regularly experience problems with accessing, managing or renaming files with paths over 255 characters long. Windows OS delivers different error messages like: path too long, cannot delete folder / file, "filenames too long", error 1320 the specified path is too long, the destination path is too long etc. Windows 7 is not an exception and this OS is still experiencing many of such problems like "cannot delete file, path too long". To delete an inaccessible file or folder you’ll simply need to browse to it and press the “delete” button. As simple as that! You can effectively utilize our path too long application at home or on the corporate computers. It’s truly portable and user-friendly, thus you won’t have any troubles while using it for your needs. On the video above simple steps to delete locked files or folders as well as "filenames too long" issues were illustrated. 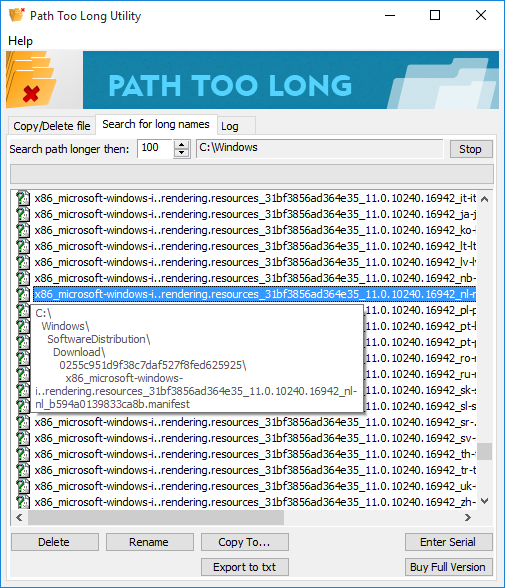 Use Path Too Long PRO if you wish not only copy and delete but also rename files and folders with long paths error 1320 or locked by some applications, like viruses, adware, different OS etc. They can’t be normally accesses under Windows therefore user is unable to delete them. Please check other Features of the "path too deep error 1320" removal software or more details.